The Dartmouth Learning Network provides opportunities for adults and their families to gain the essential skills necessary to live and work in a modern economy. Our classroom, small group and one-to-one learning options, support adults to build their reading, writing, math, computer and essential skills so that they can realize personal goals, further education, apprenticeships and employment. As part of a continuum of services offered through the Nova Scotia School for Adult Learning, the Dartmouth Learning Network’s programs provide a strong foundation and pathway to further education and lifelong learning at home, in the community and at work. We partner with like-minded community agencies to foster literacy and lifelong learning skills within families. Our vision is that everyone has the skills they need to reach their earning and career goals. Under the direction of the Executive Director, the Office Cleaner plays an integral role in providing a safe, welcoming and professional space to facilitate learning. 5 hours per week (September through to June 15th annually) at $15.00 per hour. 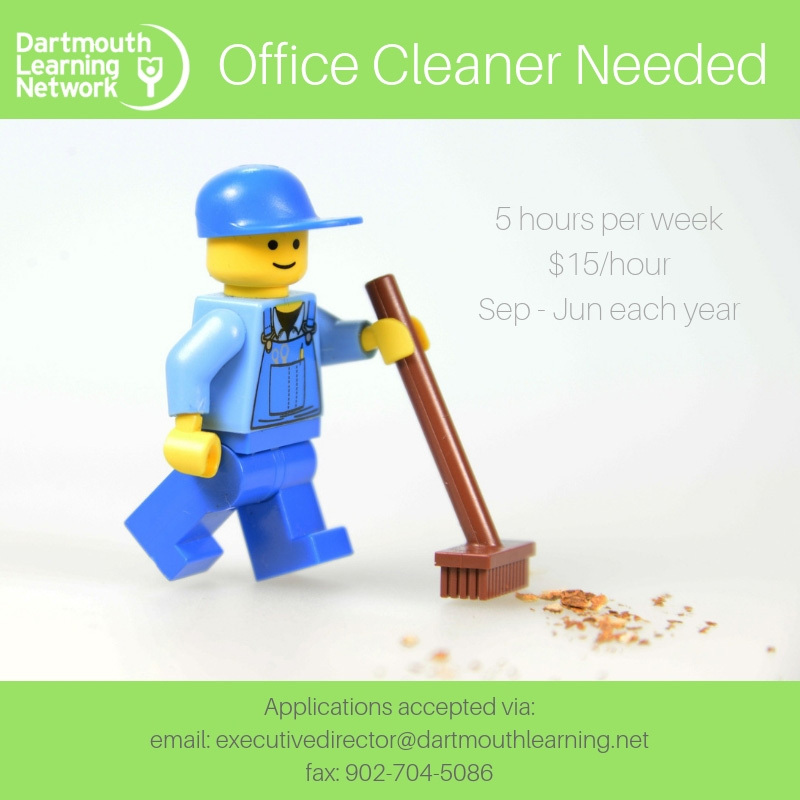 Interested candidates should submit their resume to Alison O’Handley via fax 902-704-5086 or email executivedirector@dartmouthlearning.net.